As a medium for data storage on a computer or laptop, of course, we must use one of the many hard peragkat known people that is Hard Disk. 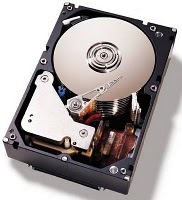 Up until now many companies that manufacture a wide range of Hard Disk which has a variety of types, sizes, and brand. For example, below are some brands are quite famous Hard Disk which include Seagate, Western Digital, Maxtor, and Hitachi Deskstar, Samsung. In the era of increasingly advanced as now we can find many brands of Hard Disk, this could confuse potential buyers Hard Disk. For that I wanted to give a little information about the advantages and disadvantages of each Hard Disk. 2. Now there are two options that can dipilihseperti Hard SATA / ATA. SATA Hard Disk is a fast class. 3. Durable and can be used for 24 hours nonstop. 4. The price is relatively cheap. 5. For international product, Seagate is providing warranty for 5 years, while for the local product warranty to 3 years. 1. Because it has a fairly high RPM, Hard Disk Seagate becomes hot quickly. 2. When compared with other brands of Hard Disks of the same size, maybe Hard Disk Seagate has a price that is quite expensive. Western Digital is the company's competitors in the competition Seagate Hard Disk course. In 2010 the company Western Digital has now become the world's largest Hard Disk. It is evident from its success selling Hard Disk'nya around the world with approximately 800ribu more units. You all want to know why the Hard Drive from Western Digital (WD) is widely used by the public? 1. Have the same RPM Hard Disk products from Seagate. 2. Prices are relatively cheap. 3. Has a 1 year warranty. 4. With a fairly high RPM class, but the Hard Disk is not fast heat. 5. No cause noise when in use. 1. Not quite optimal when used 24 hours nonstop, and if it continues to heat can cause speednya down and continued to decline. Maxtor is a company that once earned the company the largest disc producer. But now, the Seagate take over his company and now both companies work together in producing the Hard Disk the more environmentally friendly. 1. Has a speed nearly equal to the Hard Disk Seagate and Western Digital (WD). 2. The design is nice and interesting to look at. 3. The price is cheaper than the price of Seagate Hard Disk. 1. Hard disks are faster as hot as Seagate Hard Disk. 2. This one product more frequently exposed to Bad Sector. Hitachi is a company that produces so many electronic items of interest to the community. One of the products produced by the Hard Disk. In addition the company also provides a Hard Disk for Notebook. 1. Hard disks have the same RPM Hard Disk with others. 2. Hard Disk is still cold when used for 24 hours non-stop. 3. The price is quite cheap. 4. Still sticking with the ability to use 24 hours initially. 5. Offer a long warranty that is about 2 years. Hearing the name alone would have been familiar to you all. Samsung is now also engaged in producing the Hard Disk. Samsung Hard Disk should be made to produce better quality than its predecessor Seagate and others. Nowadays a lot of Hard Disk from Samsung on the market. Starting from the Hard Disk internal to external Hard Disk. 1. Save up to 50% power. 2. RPM-7200 RPM to 5400 RPM. 3. Not produce a sound that is so noisy when used. 4. The design is quite interesting. 5. The price is quite cheap.